This article examined a large group of US military soldiers, over 20,000 in fact, half having only one previous recorded concussion, and the other half never having a documented concussion during their time in the military. They examined how many of these soldiers went to the infirmary for lower extremity, or leg, muscular or ligamentous injuries over the course of 2 years. What they found was very interesting. · Soldiers who were concussed, they had both a higher occurrence of injury not only weeks after their concussion, but up to 1.5 years after being diagnosed with a concussion. 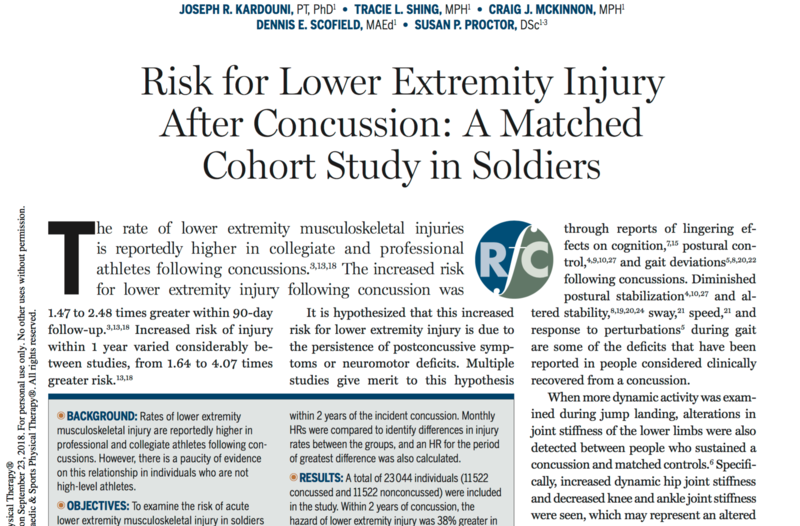 · Risk of leg injury was also 30-48% higher in concussed soldiers, versus their non-concussed colleagues. · Another study performed on college athletes, led by Dr. Alison Brooks in 2016, demonstrated an increased risk of leg injury after concussion, with up to a 2.48 times increased likelihood of injury during a 90-day period after returning to sport versus non-concussed counterparts. There are many thoughts as to why this is, the leading being a loss or decrease in the brains ability to control leg movement, especially with highly dynamic tasks, such as playing sport. What does this mean for those who have suffered a concussion? Clearly,more research in this matter is needed to examine the link between concussion and injury risk. However, with this information, athletes and all those who participate in recreational sports should take caution with returning to their activities after a concussion, and follow Athletic trainer, Medical Doctor, and Physical therapist’s recommendations. Physical therapists can play vital roles in concussion management, as we are trained to address and correct poor or dysfunctional movement patterns that may lead to injury. · Physical therapy as treatment after concussion focuses on incremental activity and training increase after an initial brief rest period, addressing side effects of concussion such as headache, poor balance, and sleep disturbances as well as dynamic control activities to address dysfunctional movement patterns. · If you, or someone you know has suffered a concussion, ensure that a trained and appropriate medical practitioner evaluates you before resuming recreational or sport activity.